Shah Burj or Musamman Burj is an octagonal tower close to the Emperor Shah Jahan's private hall Diwan-e-Khas in Agra Fort. It was originally meant for his wife, Mumtaz Mahal. The Shah Burj contains elaborate alcoves and has also been constructed using delicate mesh work, which ensured that the royal ladies could look out and enjoy the beauty of the surrounding areas while still maintaining purdah. An exquisite marble dome tops the Shah Burj, which is flanked by a foyer with an elaborately carved fountain in the middle. The Shah Burj looks out over the Taj Mahal and is considered to be the best spot for viewing the monument. 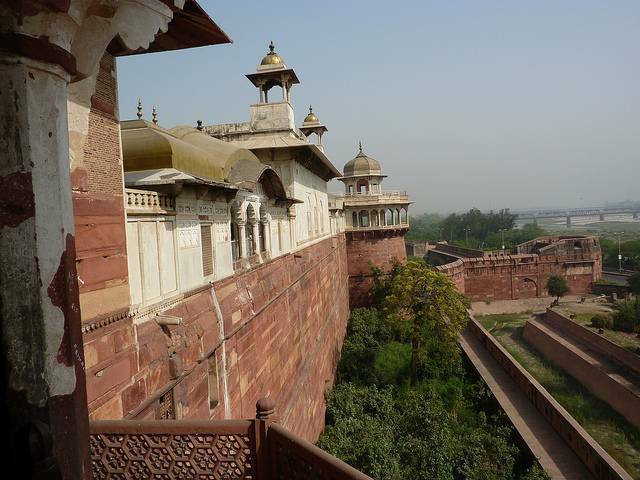 Historical records suggest that it was here that Shah Jahan spent the last few years of his life as a captive of his son, Aurangzeb, gazing out at the Taj Mahal. There is an entry fee of Rs30/- for Indian and Rs 300/- for foreigners for entering the fort and also Rs 25/- per camera for photography. The fort is open from 7 AM to 6 PM daily, except on Fridays.